This robust-tasting dip originates from Lebanon and as long as you have a food processor it only takes minutes to assemble, making it a perfect party dip for busy hosts. ‘Muhammara’ is chock-full of healthy ingredients and the addition of pomegranate molasses and seeds helps create a delicious and exotic-looking result. 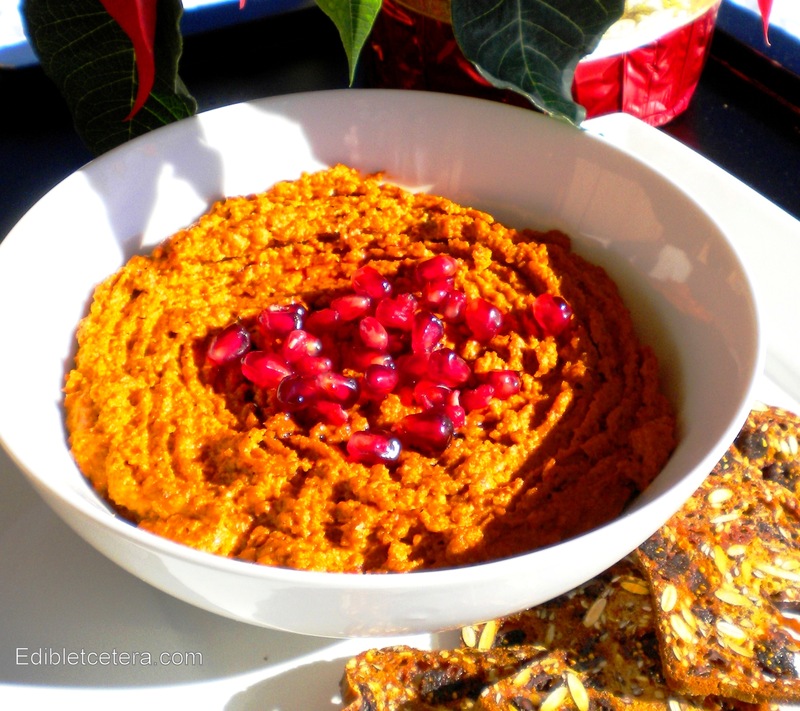 The recipe, along with a bottle of *pomegranate molasses, was a welcome gift from a friend who frequently travels to Eastern Mediterranean and Middle Eastern countries and brings back spices, recipes and inspiration. You know who you are and thanks for sharing! The original instructions didn’t call for toasting the walnuts first but I thought it would add a nuttier depth of flavor (it does). To toast walnuts, spread them (halves or pieces) in a single layer on a baking tray and toast in a pre-heated 350F (180C) oven for 8 minutes. To get rid of some of the skins, swirl them around in a fine mesh metal strainer over the sink – I prefer this method to rubbing them in a kitchen towel that then needs to be washed. All that said, you can use walnuts straight from the packet if you can’t be bothered or don’t have time. The same goes for cumin powder that’s available everywhere. I like to amp-up the flavor, so I make my own by dry-roasting whole cumin seeds on the stovetop in a small pan until they became fragrant and start to darken (3-5 minutes), then I grind them up in a pestle and mortar or spice-grinder. You can store what you don’t use in a small screw-top jar. Muhammara is best made a couple of hours ahead to allow the flavors to develop. Add the pomegranate seeds just before serving and here’s a tip: don’t waste your money buying expensive plastic containers of pomegranate seeds because you think extracting them directly from the fruit is laborious; all you need to do is roll the whole fruit around on a hard surface, pressing down quite firmly with your hand. This loosens the seeds inside the fruit. Carefully slice it open over a large bowl to catch all the juice and seeds which will easily drop out with some slight coaxing…wear an apron or dark clothing because any squirts of juice are a bugger to remove. The dip will keep covered in the fridge for a few days. Serve it with pita toasts, a selection of crudites or your favorite crackers. * Pomegranate molasses can also be labelled ‘syrup’, ‘concentrate’ or ‘cordial’ (not to be confused with POM juice that you swig straight from the bottle); they’re one and the same thing and are available from good supermarkets or Middle Eastern food emporiums. Put all the ingredients except the olive oil into a food processor and blend together. While the motor is running, slowly pour in the olive oil and continue to blend until you have a smooth paste. Stop partway through and scrape down the sides if necessary. Transfer the dip to a serving bowl, cover and chill for at least 2 hours and up to 24hrs. Before serving, scatter with fresh pomegranate seeds and a drizzle of pomegranate molasses/syrup/concentrate. Muhammara will keep covered in the refrigerator for 2 to 3 days. Jackie, you are so knowledgable about food. Think you should put all of this in a book with photos. This appetizer is sooo yummy. It is easy, healthy, unique and so delicious. Thank you Jackie for yet another fabulous recipe! This really answered our problem, many thanks!